Holiday update: I went to The Old Vic to see The Philadelphia Story. Twelve quid for a front row seat- Ah the delights of being under 25. A most pleasant way to spend an afternoon. I was left internally chastising myself after slimy Spacey first appeared on stage to great applause and general acclaim. Whistling and whooping. I immediately thought “How vulgar”- And there was me thinking I wasn’t a total snob. It’s just that no matter how famous the performer is I will sit on my hands and appreciate silently in my head until the end when I will applaud, yell etc (I can’t whistle) as appropriate. I just can’t belive that exact phrase popped into my head. Dear me. Anyway, it was amusing. Lightweight, slightly cutting comedy. All sadly incomparible to the film version and Jennifer Ehle suffers when compared to the wonderful Ms. Box Office Poison for whom the role was written. A no-win situation. Probably best not to compare. Nice set and costumes, comic timing 9/10, believability of Dexter’s cruelty but unswerving true love 0/10. Unfathomably, I find the nickname of Red wonderfully romantic. Started and finished A Fine Dark Line. Very good americana with genuinely disturbing moments. I don’t get unnerved often through literature but with this Lansdale I did. I like the way the Mojo Storyteller can write wonderful hallcinogenic tales and write “straight” works and also that they are all filled with the same small-town gone bad elements. If any literature is going to weird me out or disgust me it is Lansdale. I love him for it. So, I finished my Solo outfit with about a half hour to spare and transported myself to bang my face. A really rather intimate venue ie dancing in a broom cupboard. Very kids tv. Me, Ewok Village Leia and Generic Jedi turned up outfitted as, erm, Han Solo, Ewok Village Leia and a guy in a cloak to find that only two other face bangers had bothered to dress Star Wars. Not very well either. 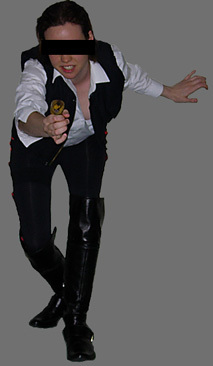 If you’re going to go as Hoth Rebel Base Leia you’ve got to match your utility belt to the rest of your outfit. Duh. A fun evening with variable music. Not enough Star Wars music in my opinion. Rar. Then on to 333 which was pretty shite. Grim, skanky and full of skanks. I’d been there for about 5 minutes before men stroked my arm as I went up the stairs and smacked me on the arse as I walked around the bar area. Hands to your white loafered selves you fucks. Fleeing early we moved to the Brick Lane Beigel Bake for smoke salmon, tuna, salt beef and chocolate fudge cake. Polystyrene cups of tea and coffee and cartons of Ribena. Yummm. A bus, a train and another bus and we were home by 7.30am. Home to Patrick. Sunday I made an raft in the buttercup and vetch meadow that is the back garden out of some cardboard and my sleepingbag. I spent the day afloat in the glorious sunshine (factor 15 naturally) devouring The Tattoo Murder case, slurping Ribena and watching the light on the maple leaves. Sigh. The Takagi was really very good indeed. Interesting, thought-provoking and delightfully exotic. Maybe it’s the translations i’ve read but Japanese literature has an odd structure. Everything formal yet informal. I can’t explain why or give examples, it’s just a feeling I get. Now i’m on to Crime and Punishment. Why oh why do I always read the relatively easy to read works first? Also caught The Fog of War– Meant to watch it on the big screen but as usual I couldn’t get my arse into gear. Excellent. Makes me want to find out more. I haven’t seen any other Errol Morris docs before- I must try and get hold of some. Yeah so I didn’t have a blaster to hand. Deal with it.